Here is the summary of our meeting about final group exhibition. We need to finalize the opening date, title of the show and artists’ works to be exhibited. Title of the Exhibition- not yet finalized- any suggestions? Thanks to all who shared their work on Tuesday, I look forward to hearing about the rest of your work next week! 1. Each person does an individual creative project created before final show that you will propose to Thea and Jevi by week 12 for approval. 2. One ore more groups of students will produce a collaborative artwork created before final show, again proposed by week 12. 3. One or more groups of students will produce a collaborative piece at a final event, with the participation of the public (to consist of community group/s, other artists at SFAI or elsewhere, general public, and/or another group of your choice). Let’s get this conversation going! What are people thinking of doing? 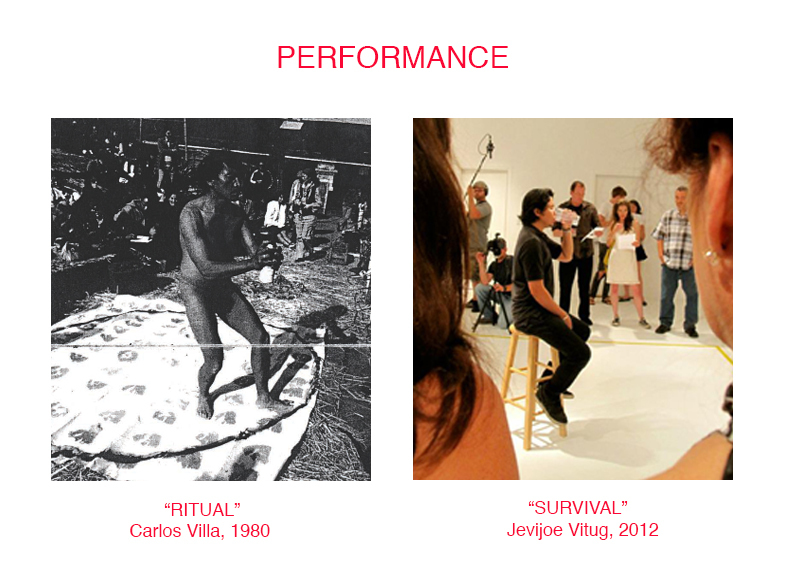 This week, artist/students will bring work (maximum of 3 works) that tells a story in conversation with Carlos Villa’s work and art practice. 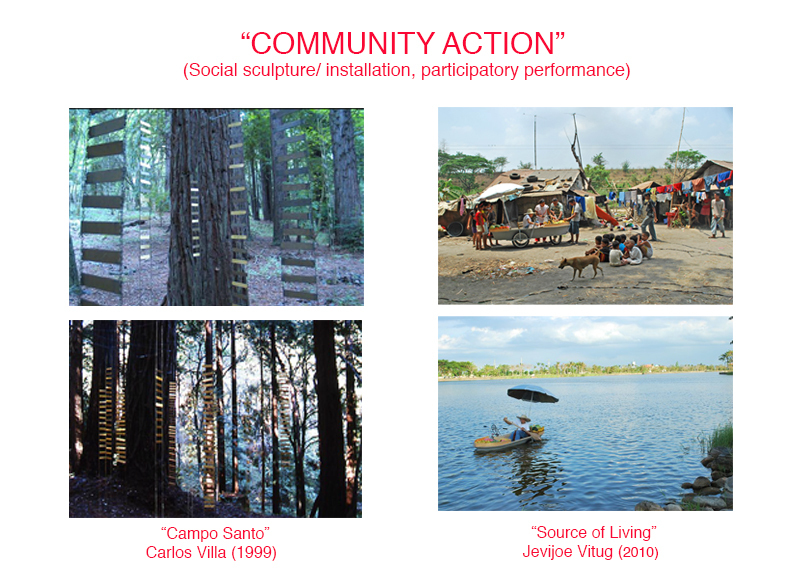 Carlos Villa had a wide range of art practice- from abstract painting, mixed media, sculpture, installation, performance, community-based projects or social practice as well as organizing symposia and lectures series and art teaching. The concept of the activity is to present your work along with a work by Carlos Villa- for instance showing an abstract painting along with Carlos Villa’s painting and comparing the similarities or even dissimilarities in terms of style, content, and/or issues each work is addressing. You can bring an actual artwork such as painting, photographs, small sculpture, or even render an impromptu performance in the class. You can also bring in electronic files of your work, in .jpg format that will be sent to Thea (ttagle@sfai.edu) before class. If you have organized (or have participated) in a community-based project or curated an exhibition, you can make a presentation using powerpoint and website links. The presentation should be atleast 5 mins to 7 mins long but if you are presenting a video or film, you can make short segments or clips of your work (10 to 15 mins ). We will also have an open critique and discussion after each presentation. 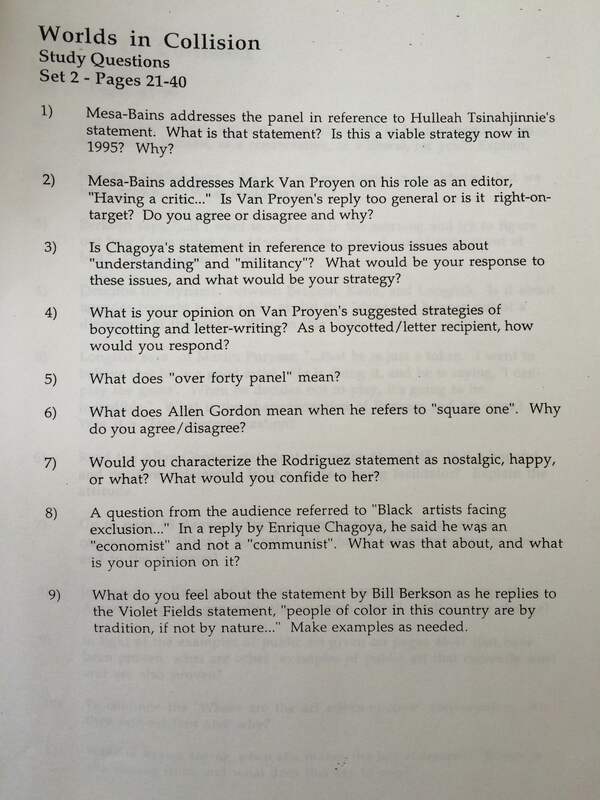 In Carlos Villa’s critique class in 2009, before students presented their work, he always asked us these questions- “For whom ?” and “what for?”—that you should also consider when selecting your art works and preparing your presentation. “For whom?” What is the work all about? Is the work intended for oneself, for the society (immediate environment, current social issues or concerns) or history (like paying homage to your past or investigating historical past that have been largely forgotten)? “What for?” What is the intention of the work that is relevant to the artist, in response to his/her immediate environment? what was the rationale of the artist? or what triggers the artist in making such a work in that particular moment? Are there any similarities regarding your work presented and Carlos Villa’s, in terms of concerns and issues that he addressed in his individual practice; his curatorial projects; in the symposia that he organized; or in his teaching? Is yes, why? If not, why? 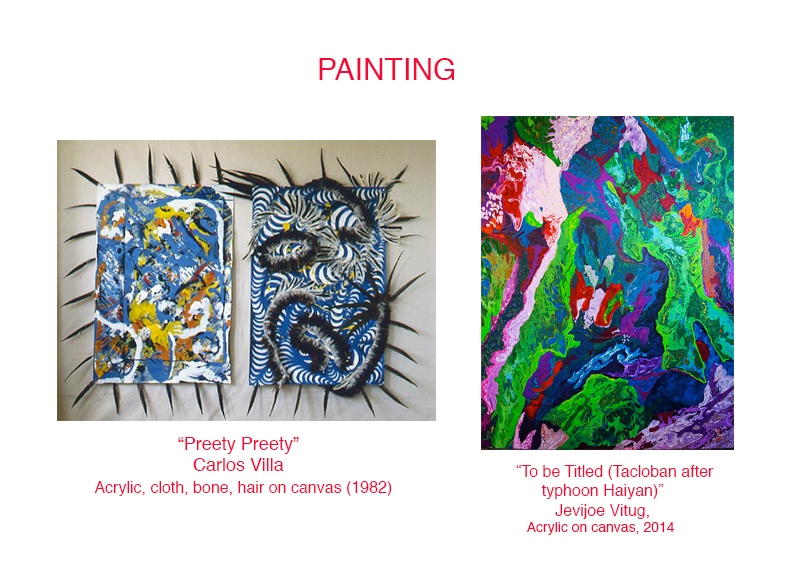 Below you will be able to see three conversation pieces by Jevijoe Vitug that will give you an idea for the project. This week focuses on Filipino American art, a teacher once told Villa that there was no Filipino art history to investigate. Do you think this inquiry could have motivated him to be the “interlocutor” to fill such historical absence/gaps? What kind of strategies did he use/employ as interlocutor? In Carlos Villa and the Integrity of Space article (edited by Theodore S. Gonzalves), why do you think Carlos Villa is neglected by art historians and by Asian-Americanists? What is meant by the term “art action” in Villa’s “artwork”? 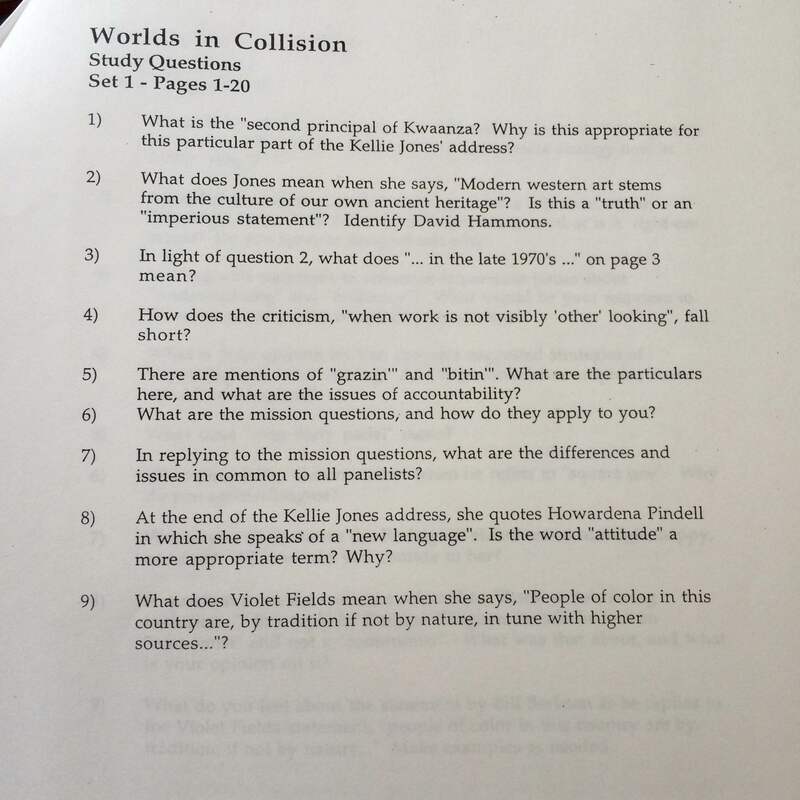 Regarding the Worlds in Collision website (http://worldsincollision.org) devoted to Filipino American art history, it seems hasn’t been updated in a while, any comments or suggestions to improve the site? This week, we will be talking about The Agenda for the 1990s, a symposium that was later compiled in the book Worlds in Collision. Its mission questions were the following: 1. Where are we? 2. What are we celebrating? 3. What are the issues that the art and artist of color face in the 1990s? We will be having a brief class visit tomorrow from Dewey Crumpler, a fantastic artist, fellow SFAI professor, and a close friend of Carlos. He will be speaking about his own work and of “multicultural art” as they were debating it in the late 1980s and 1990s. Here is a link to an interview of Dewey by Carlos Villa for Villa’s Rehistoricizing the Time of Abstract Expressionism project. You might want to click on these links to learn more about Dewey’s work before he comes speak with us tomorrow, in case you have questions for him! This week topic focuses on community activism in San Francisco in the 70s plus an oral history interview with Carlos Villa to give us brief overview of San Francisco art scene in those days. It is remarkable to note how our school (SFAI/ CSFA) plays a major role in shaping the local art scene here in the Bay Area particularly the “community mural movement” of the seventies. Are there any differences between community murals in the seventies (mentioned in Lost Murals of the Seventies by Timothy W. Drescher and Art and Social Consciousness by Margo Machida) and street/urban art today in San Francisco? in terms of subject matter, style and concern? What was distinctive about Mujeres Muralistas on collaboration and how they deal with funding? Does it have something to do with the “rasquache” strategy of resistance and resilience? In the article, “Third World Art is a State of Mind” by Paul Kagawa (Other Sources: An American Essay), do you agree that such “cultural cartel” exists in the art world?